The poems in Night's Glass Table are tight and emotionally powerful, and deal with themes such as death, grief and love. Zelas chooses her words with care, and her poems are always eloquent and evocative. She demonstrates a sound use of conventions, and her writing is well-crafted and technically excellent. Night's Glass Table won the 2012 IP Picks Best First Book Award. Karen Zelas lives in quake-struck Christchurch. A former psychiatrist and sychotherapist, she returned to university, taking creative writing papers at Canterbury University in preparation for giving up her day job. Since 2004, her poetry has been increasingly widely published within New Zealand, including in Landfall, Poetry New Zealand and Takahē, and broadcast on radio. It has also appeared in Australian ezines Snorkel and Eclecticism and recently been blogged by Interlitq (UK). Several anthologies contain her work. Her first novel Past Perfect was published by Wily Publications in 2010, and was released in ebook editions by Interactive Publications this year. Having an interest in the visual presentation of poetry, Karen participated, in April 2007, in an exhibition entitled feathers unfettered, featuring her series of poems about native birds of New Zealand. The exhibition was mounted with artist Galina Kim and quilter Sue Spigel, in Christchurch. In 2009, she was the recipient of a Creative Communities grant. 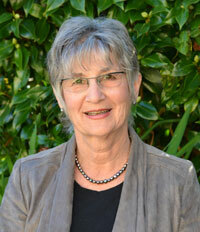 Karen is editor of the anthology Crest to Crest: Impressions of Canterbury, prose and poetry (Wily Publications, 2009). For the last five years, Karen has been Fiction Editor of Takahē literary magazine and chairs the Takahē Collective Board. She is married with children, grandchildren and child-substitute: a miniature poodle. "A beautiful, elegant poem, with just the right balance between present and post, the concrete and a sense of the ephemeral." "… the mot juste to characterise these poems is the word meticulous: meticulous invocation of place, of nature and of the human heart; meticulous choice of word, the arrangement of words and of their effects; and, ultimately, meticulous in the way the poems contribute to the architecture of the book … This is a rich and evocative set, resonant with other readings, with travel and memory, but above all with Karen Zelas’s carefully wrought language and imagery, so often surprising and memorable." "In both compositions, glass becomes a signifier of representation, illumination and imitation. At times, dark, at times bright, these collections offer divergent ways of looking at their topic, each piecing together a concrete set of lyrical ideas composed through exquisitely used language; so that, like concept albums, Zelas’ works shape and develop unified stories, coalescent narratives. The result in both cases is a poetry collection which is truly accessible while still retaining great depth and complexity. 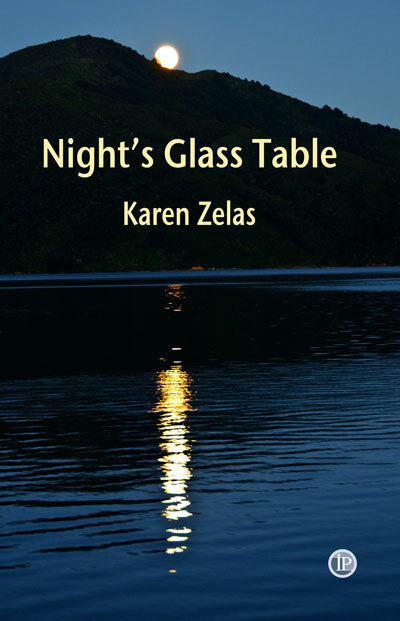 Karen Zelas’ first collection, Night’s Glass Table won the 2012 IP Picks Best First Book competition, and it’s easy to see why. The poems in this book have real impact and many have previously appeared in prestigious journals here and overseas, such as Landfall, Snorkel and Interlitq (UK). The opener ‘My House Has Many Rooms’ exemplifies the rich vocabulary and evocative imagery at the heart of the work more generally. The external versus internal; the human versus animal; the acoustic versus the luminous; the uttered versus the unspoken; the restrained versus the liberated: it’s all intimated and explored here, succinctly so in a few tight verses. Such subject-matter forms a strong platform for what is to come. Wherever they are located — Ossetia, Moscow, Berlin, at home — the poems which stem from this opener, revivify and expand its poetic terrain. Sensitive, understated and linguistically precise, Night’s Glass Table is a powerful first collection. Its’ array of lyrical subheadings (…through tinted glass or eye; Deep in the womb there is a room for you…. ; The study’s full of fertile loam…. ), riffs off the first poem, ably display its power, its delicate punch. As a collection it offers so much sparkle, so much promise, that what the author might release next is greatly anticipated." "… a beautiful collection. Karen Zelas offers a sharp eye for detail, a skilful sense of cadence, an adept command of poetic possibilities and an astute engagement with life’s biggest question. The result is a striking yet accessible first book of poems … lucid yet edgily dark." "It's that play between head and heart that really does typify Karen's Zelas' best poems." "I enjoyed these sharply-observed poems about relationships, travel, family, and life in post-quake Christchurch. There is a lot of poetic technique, and many years of thought, at play here." "If you like your poetry full-blooded, then Night’s Glass Table is where to look. Karen Zelas’ voice is passionate, direct and spills effortlessly into song. A coherent poetic identity and voice takes a wry look at the (largely) urban world in which the poet lives. There is a ruthless, unsentimental honesty to much of her writing – indeed, at times, a kind of emotional nakedness seems to be apparent, as we see in the second section, “Deep in the womb there is room for you ...” There is a lot of pain here, but it is pain that the poet generally seeks to understand (without any easy belief that it can be escaped or transcended) rather than to wallow in. Although fairly short, the poems achieve an air of spontaneity, such that one wants to read them repeatedly. But the best poems pack an attractive punch, whether humourous, compassionate or acerbic. comprehension of what is implied. The precision of Zelas’ poems is a recurrent delight. Her real but unaffected attentiveness to detail is registered in language which makes such attentiveness evidence both of self-consciousness and, paradoxically, of a process of self-discovery. Podcast of Arts on Sunday interview of Karen with Lynn Freeman. Still standing on her head: Tuesday Poem poets' hub quotes Karen's poem 'The Weight of Calves'. Feature by Helen Lowe on Night's Glass Table, quoting the poem 'Re-vision'. a nook, a look through tinted glass or eye. to shelter. Sink into downy clouds. Sip on evening’s fruity brew. For reflection, enter bathroom calm. by which to mark my stride. silhouette of hip and rib and thigh. the valley’s dam is full, begins to overflow. of a long, long day.